Radio New Zealand is a Crown entity established by the Radio New Zealand Act 1995. Radio New Zealand has three nation-wide networks: Radio New Zealand National, Radio New Zealand Concert and the AM network. Radio New Zealand Concert broadcasts mostly classical music and also jazz and world music. Radio New Zealand broadcast schedule includes locally produced classical music programming, information about music and programs featuring internationally renowned orchestras, opera. Radio New Zealand broadcasts work from New Zealand musicians and composers, and initiates a wide range of music programs, it delivers live concerts of both New Zealand artists and visiting international artists. Radio New Zealand provides comprehensive classical music programming, combining original productions and distinctive specialty programs. Radio New Zealand helps keep the arts thriving in our community by making wonderful classical music accessible to all. Beethoven.com is the World’s Classical Radio Station. Beethoven‘s classical broadcasts are the most appealing classical music, with special emphasis on new releases and music of timely interest. Great works – broadcast complete – by the foremost composers are complemented by intriguing discoveries. Beethoven station strives to provide the best and broadest selection of classical music and fine arts programming, which we have in the world. The aim of this station is to be the best place on the Internet for lovers of classical music. Beethoven‘s broadcasts are the finest in classical music and bring listeners renowned programs such as Mid-Morning Mozart, Symphony Sunday, Three O’Clock Symphony. Every Sunday at 6 p. m. listeners can hear Symphony Sunday. This program is hosted by Nicole Marie and provides the best in symphonies of Beethoven, Dvorak, Mendelssohn, Mozart and also the information about these composers and their thoughts while composing your favorite symphony. Every weekday at 3 p.m. Beethoven station broadcasts Three O’Clock Symphony, this program is hosted by Scott Birmingham and provides a selected symphony from one of all-time favorite composers. Wolfgang Amadeus Mozart (full name Johann Chrysostom Wolfgang Amadeus Mozart) (27 January 1756 – 5 December 1791) is one of the most significant and enduringly popular composers of European classical music. He wrote more than 600 compositions for symphonic, concertante, chamber, piano, operatic, and choral music, and huge part of his works are the standard concert repertory and are widely recognized as masterpieces of classical music. 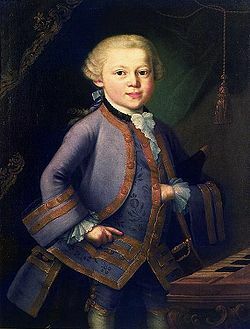 Mozart was born in Salzburg into a musical family and from very young age he had a gift for imitating the music he heard. Mozart‘s music, like Haydn’s, is seemed an archetypal example of the Classical style. Mozart’s works spanned the period during which classical style transformed from the style galant to one with some of the contrapuntal complexities of the late Baroque, complexities against which the galant style had been a reaction. If we look to the period of time we can see, that Mozart’s own stylistic development paralleled the development of the classical style as a whole. Clarity, balance, and transparency are hallmarks of Mozart‘s works and in the same time a simplistic notion of the delicacy of his music the listener can hear in his finest masterpieces, such as the Piano Concerto No 24 in C minor, K. 491, the Symphony No 40 in G minor, K. 550, and the opera Don Giovanni. During his working life, Mozart switched his focus from instrumental music to operas, and back again. He wrote operas in each of the styles current in Europe, for example, opera buffa, such as The Marriage of Figaro, Don Giovanni, or Così fan tutte; opera seria, such as Idomeneo; and Singspiel. Mozart‘s music, like Haydn’s, stands as an archetypal example of the Classical style. His works spanned the period during which that style transformed from one exemplified by the style galant to one that began to incorporate some of the contrapuntal complexities of the late Baroque, complexities against which the galant style had been a reaction. Mozart’s own stylistic development closely paralleled the development of the classical style as a whole. In addition, he was a versatile composer and wrote in almost every major genre, including symphony, opera, the solo concerto, chamber music including string quartet and string quintet, and the piano sonata. While none of these genres were new, the piano concerto was almost single-handedly developed and popularized by Mozart. He also wrote a great deal of religious music, including masses; and he composed many dances, divertimenti, serenades, and other forms of light entertainment. Philharmonic Radio Taipei on 99.7FM – Taipei, Taiwan classical music radio station. Philharmonic Radio Taipei 99.7FM is the biggest classical music station on Taiwan. The station began broadcasting in 1994 and have been on air for over 14 years. Philharmonic Radio Taipei main goal is to bring classical music to every city in Taiwan, to every school librarie! Philharmonic Radio Taipei 99.7FM has special children’s programs “classical for kids”. Broadcast time: Monday to Thursday 20:30-21:00 juvenile music, Graffiti country music Friday 20:00-21:00. Examples of kids programs: “Fantasy world of classical music” learn children to see the classical music in the fantasy world in their imagination; “Classroom music in the air” – ” Concerto is the best performance of the musicians playing skills, the best performance of the “star style” of the type of music. Would you like to listen to different music player?”; “Composer little story” about a lot of talented composers.